A British Punk Digimon that was born when Britain's strongest hacker caused a mutation in a computer virus in which they had poured all the knowledge they possessed. Although its size is small, it has a rebellious personality that contends for first place even in the Digital World. It can't help picking fights, no matter whether the opponents are stronger or weaker than itself. 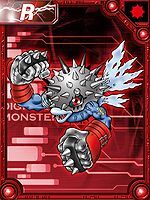 Although settling disputes with fist fights is considered its normal style, it has a Special Move "Needle Squall" as its ultimate weapon, in which it launches its super-hard spines all at once from its metal head made from Chrondigizoit. 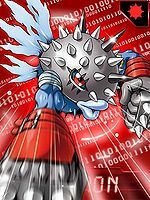 A Pukumon is part of the group defending Bagramon's Palace in Jupiter Zone. Pukumon is a villain in the audio drama. Pukumon is an obtainable Digimon. 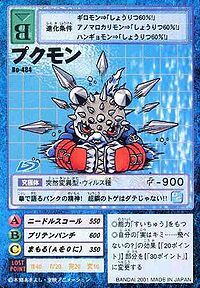 Can evolve from Waru Seadramon (0+ DP), Dagomon (0+ DP), Tonosama Gekomon (0+ DP) or Marin Devimon (0+ DP). Can be evolved from Anomalocarimon if above level 45, attack 200, and Water EXP 9900, or can be found at Macro Ocean. Pukumon is available as a Digimon Medal. 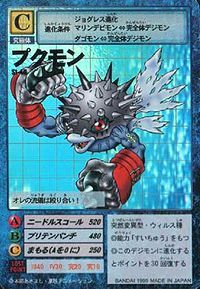 Obtainable by Jogressing Marin Devimon or Dagomon with a compatible Digimon. 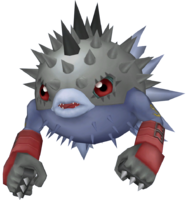 Pukumon is an enemy Digimon. Pukumon is an unobtainable Leader Digimon. Fist fighting is my style! 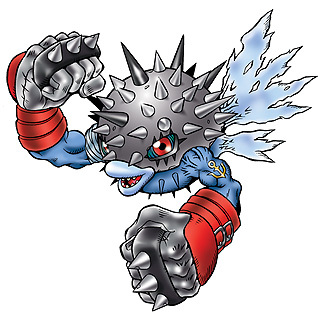 This punk-spirited Digimon talks with its fists! Its super-hard steel spikes aren't just for show! !